An Open Letter To Conventional Veterinarians | Purrrfectly Holistic...a Boutique for Cats! Purrrfectly Holistic…a Boutique for Cats! My friend and client, Kristian, came home this week to find her kitty, Maggie, waiting on the stairs inside her garage apartment. Instead of eagerly following her upstairs she lay listless, and Kristian knew immediately something was wrong. She carried her upstairs, opened the cat carrier, and Maggie walked right in. It was as if she was telling her mom “Hurry up and take me to the hospital!” And that’s where she ended up and has remained there for several days. 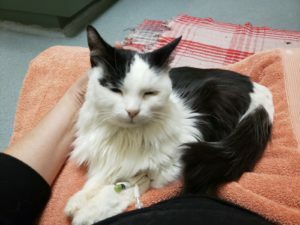 After batteries of tests including bloodwork, a sonogram, and several blood transfusions, the emergency vets were still unsure what was causing her packed cell volume to drop. PCV is a way of estimating the percentage of red blood cells. When the percentage drops below 25% anemia can be the result. This can be life-threatening because the red blood cells carry oxygen to all the cells. In Maggie’s case there was blood in her stools, and this was causing her values to drop. It became apparent she was bleeding in her intestines for some reason. The vet suspected IBD or Lymphoma but couldn’t be certain, and the sonogram wasn’t definitive either way. Her care included steroid shots, antibiotics, and other drugs for diarrhea and blood clotting. 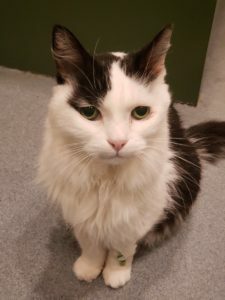 Two weeks prior Maggie’s new vet recommended changing her food to a special dry kidney formula that helps cats with constipation. Up until this point Maggie showed no other serious symptoms. When Kristian read me the ingredients in the food they included corn, wheat, soy and rice. Muscle testing told me that the new food is what caused her sudden change in health. While it’s likely that she would have ultimately become symptomatic, this food was the tipping point! Kristian and I spoke several times throughout the ordeal, and I would muscle test options the vet would recommend. I also did some energy work remotely on Maggie to release stressors at the cellular level to blood and red blood cells. Combining the best of Western medicine with energy medicine was extremely helpful to her as she made decisions. Despite their best intentions, the veterinarians who have been caring for Maggie are limited in their knowledge about feline nutrition and alternative medicine. Furthermore, the emergency vet’s first option to Kristian was euthanasia if treatment was going to be too expensive. What a way to be supportive and encouraging– NOT! This entire experience brings to mind so many things I wish I had the opportunity to say to veterinarians who only practice Western medicine. In the spirit of kindness, compassion, and love, here is what I want them to know. First of all, thank you for loving pets so much that you chose a career to be of service to them! I know the hours and the pay may not always be ideal, and it cost you a lot of money to go to vet school. You’ve had to learn about so many drugs and master numerous surgical procedures that I’m sure can be very unpleasant. I know it must be heartbreaking to have to euthanize a pet and comfort pet parents in their grief. When you use everything in your toolbox and cannot save a life it must be frustrating. Surely there are days when you have more questions than answers, and despite all your training, healing can be illusive. Due to these various situations I implore you to set your Western, conventional veterinary practices aside and look elsewhere. Please seek out continuing education that teaches you about Eastern and alternative veterinary medicine. Open your minds to the curing power of homeopathy. Explore acupuncture and acupressure techniques. Be open minded to energy medicine and the practice of muscle testing. Talk to other vets who are having success in treating pets with alternative methods that you’re unfamiliar with. Keep an open mind–perhaps Western medicine doesn’t have all the answers after all! Combining conventional and alternative medicine can be very beneficial! Understand that there’s always an emotional component to illness. Learning to identify and address these emotions complement the physical component of healing. Energy work, color therapy, crystal therapy, and EFT (tapping) are simple ways to address this. Teaming up with a holistic or integrative vet doesn’t have to diminish your credibility; think of it as an opportunity to learn and grow. Provide your clients more options and never have to say “There’s nothing more I can do.” There’s always something more you can do, even if it’s simply to provide comfort in a natural, more holistic way. Please respect the fact that I don’t want to re-vaccinate my cat again and again. Read vaccine labels, and don’t vaccinate sick or compromised pets. Ask an immunologist instead of a vaccine manufacturer how long a vaccine can potentially provide immunity. The answer may surprise you! 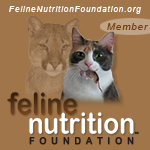 Take a course in feline nutrition that is not sponsored by a pet food company or drug maker. Until then you won’t understand how the ingredients in the food you sell contribute to pets’ diseases and illnesses. Did you know that standard flea and heart worm products contain extremely toxic chemicals that can have deadly consequences? Please find us safer, non-toxic options! Recognize that standard treatments like chemo and radiation have been found to cause and contribute to cancer in pets. Furthermore, did you know the food you recommend and sell contributes to this deadly disease? 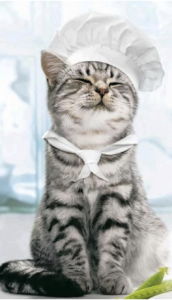 When pet parents inquire about raw diets please don’t look at them like they are crazy or treat them with contempt. Learn how ancestral diets can also benefit pets today! When discussing my pet’s health issue, whether it’s an emergency situation or not, speak to me with compassion and empathy. Please don’t assume I understand everything you’re telling me; explain it in away that makes sense to me as a lay person. Above all, remember the oath you took in veterinary school: First, do no harm. Let this principle guide you with every patient, every diagnosis, every product you sell, and each treatment you recommend. Pet parents should never be bullied or spoken to in a way that is hurtful if they challenge or question your recommendations. They only do so out of care and concern for their pets. Finally, our pets are family members, and we are entrusting their health and their lives to you. That in itself comes with a huge responsibility that shouldn’t be taken lightly. Whenever we need emergency medicine we willingly spend as much money as we can afford to ensure the best possible outcome. We would gladly give whatever it takes to spend more quality time with our furry family members. After all, no one loves our babies more than we do! In order to determine the source of Maggie’s internal bleeding Kristian decided to opt for endoscopy and possible surgery, depending on the outcome of the scope. At the time this post was written Kristian was waiting to discuss her decision with the doctor. Maggie’s spirits have been great up to this point and she has clearly shown her mom that she is not ready to say goodbye. Therefore, Kristian will continue to fight for her and provide every available resource to help her recover. She has created a Go Fund Me page to help with Maggie’s care. If you’d like to contribute she and Maggie would be grateful! Maggie is one special kitty! I love this letter! It says everything I should have told my cat’s vet. Thank you for all the great articles.